Gaetan Belanger and his fellow workers often produce very detailed locomotives and rolling stock. 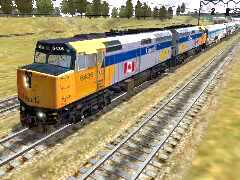 On about 07-Mar-02, Gaetan released his version of the VIA F40PH-2D No. 6436 locomotive. This is a valuable download to have, especially when it's combined with the VIA passenger set, also designed by Gaetan (available from Train Artisan). A note before you start: if you've downloaded and installed the VIA F40 loco from Train-Sim.com, then it's probably best to delete it. Gaetan's F40PH installs into a folder called VIAF40 and MSTS gets confused when there are locos by the same name, even though they may be in different folders. installation takes place (read the "help" for French translation of the button text). Now start up ConBuilder and put together a consist for your brand new VIA F40PH then explore a route or two with it in MSTS. Before getting into MSTS, you may want to clean up by deleting the files you've extracted: you can delete the folder C:\Diamond\ and delete the files in unziptemp so that you're left with just the two original files you downloaded in your Downloads folder.